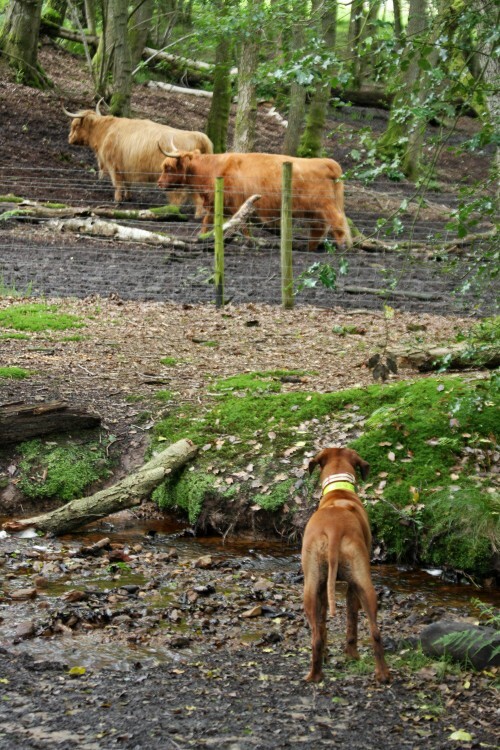 This entry was posted in Dog life in the South of England, Rhodesian Ridgeback, Wordless Wednesday and tagged highland cattle, long horned highland bull, Rhodesian Ridgeback, Wordless Wednesday. Bookmark the permalink. They remind me of hairy longhorns! I always enjoy seeing the longhorn cattle when we get out west. They’re so much more interesting-looking than regular cattle. umm…are those your new neighbors??? Where are you Zola? 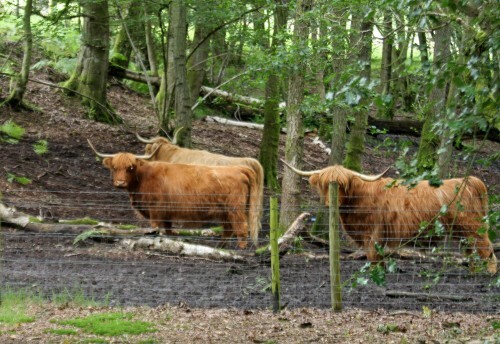 Do they really have long-horned Highland cattle in the Surrey Hills? The LOTH says “Thank you very much for your lovely email. We were happy to hear you are adjusting to life in England. It wouldn’t be so ‘green and pleasant’ if it wasn’t for the rain”. Did you get a bit of sun today? We did. And then another thunderstorm and now it’s sunny again. I was in the Devil’s Punchbowl!!! Its a National Trust heathland that my human knows very well (luckily! )..so she knows where the highland cattle and ponies hang out..there are many legends and tales from this punchbowl..she is writing a post on it this week!! http://freespace.virgin.net/wbb.ltd/titles/spiritofpunchbowlfarm.html…..an old children’s book set in the punchbowl ‘Spirit of the Punchbowl’..
No sunshine here..apparently next week..yippeeeeee! Well, Papa Sion is still waiting desperately to hear from you Zola…so I am sure you will drop us a line in the coming days, as you have SO much rain nothing else to do:))) Keep dry and be good…we hope one to introduce you to our Imkahena Hottentot’s Bokkie…aka Red Girl!